Daniel Boone Regional Library’s Book Bike is visiting campus! 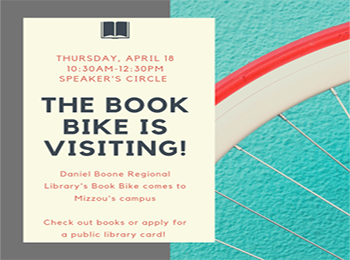 On April 18, 10:30AM-12:30PM, come to Speaker’s Circle to see the Book Bike. Check out a public library book or apply for a DBRL library card! For more information about the Book Bike, visit DBRL’s website.